First of all, you all should totally read this story, if only to put your name in the hat to win a free trip to Malpais, Costa Rica. That's kind of all I need to say, right? Here's a story I wrote for AOL's My Daily (or is it now Huffington Post Media Network?) about girlfriend getaways for Valentine's blues. I'm married and I don't even like Valentine's Day. Maybe I should go to Costa Rica? Pura Vida, man. I spent this weekend on a cruise for work (don't ask–or do ask–either way I'll explain at a later date, but let's just say it involved lots of drunk travel agents dancing to a striking rendition of Red Red Wine). After arriving back on dry land (hallelujah! ), we rushed home to see Hugh Jackman prance around (really? he's straight? ), Angie & Brad grin at Jen and Micky Rourke look, well, disturbing and like Mickey Rourke. ANYWAY, tomorrow I'm on deadline, so I figured that for your sake and mine (and because I've used up all my time), I'd make today's post short and sweet. DUDE. I've now spent so much time rambling about keeping this short that I've gone on forever. SO, the point: about a year ago my ingenious sister signed me up for "Pickle Of The Month Club." I'm a pickle fanatic (clearly in keeping with my salt addiction) and I was thrilled to say the least. Anyway, Month Club Store became sort of a thang in my family and so, as one gift for my last birthday, my family got me potato chip, pickled vegetable and beef jerky of the month. 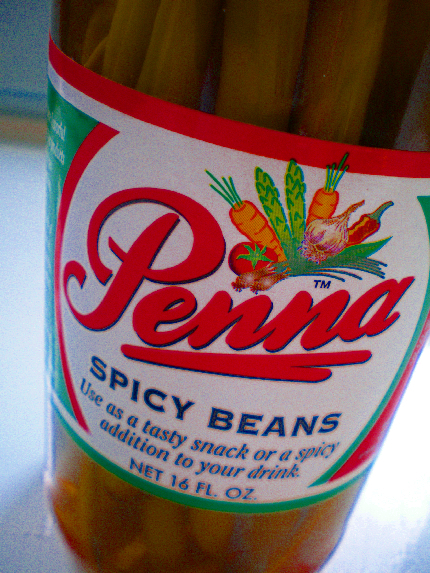 So far the pickled vegetable has been SO good, but this month's (which arrived this weekend) is particularly tasty: Penna's Spicy Pickled Beans grown on family land and created in Sacramento Valley, California by a couple who met in third grade. The string beans are totally delicious and tangy as a snack and would probably be fab in a bloody mary situation too. So, I'd like to thank my sister, for finding Month Club in the first place and my parents for buying this particular subscription for me. And, also, I'd like to thank Maurice and Cindy Penna without whom these treats might never have been possible. Oh, and of course the Academy. You've always got to thank the Academy.